2006 was like no other year in my life. For various reasons over the course of 2005 I found myself in new situations – jobs, home, life, music, love, etc. And I met lots of new people. In 2006 I probably met more new people than in the last 3 or 4 years combined. And by the start of 2007 it was all different again. 2005’s batch of serious, serious albums faded into the background. 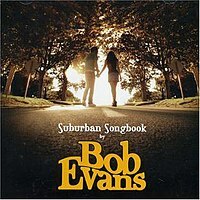 And at the heart of my 2006 was a sweet, wistful, cautiously optimistic and affectionate album by a guy named Bob Evans. The album is Suburban Songbook. Actually, his name’s not Bob Evans but Kevin Mitchell. And although this was the second Bob Evans album, I had been following Kevin Mitchell’s career (on and off admittedly) since 1997 with his old band Jebediah’s album Slightly Odway. Bob ended up on EMI (staffed by some of his Murmur records buddies at the time), which is where I found myself in 2006. I liked his first album but didn’t love it. So when Craig gave me this album before it came out, I had lukewarm expectations. His hook in selling it to me was the production by Brad Jones (who worked on the two Josh Rouse albums I talked about earlier) and Ken Coomer (formerly of Wilco) on drums. I have to admit the first couple of listens passed by without event, without any revelations or epiphanies. But then the simplicity of Don’t You Think It’s Time?, the opening track, started to seep into my brain. I have vivid memories of going to work, sitting on the bus at Military Road, passing the McDonalds just before my stop, and listening to this song. Then, listening to this song as I caught the bus down Spofforth Street to the ferry, and then going over Sydney Harbour at sunset, adding an unnecessary 20 minutes to my trip, but the most beautiful thing you will ever see. In winter when it was dark already, and this song was still on high rotation, I would be halfway through this song at the bus stop at the IGA and Jo would turn up and we would talk about something random, and I’d continue the song after she was gone. It’s a beautiful song. It has a real hymnal quality. A hymn for us, the cautiously optimistic romantics. It’s kind of what Pete Seger calls a grocery list song – it jsut lists stuff. And the lyrics could be so banal in other contexts. But Bob’s clear, uncynical heart shines through. And the song becomes some weird Zen help book. Like a good friend who opens your mind, and questions you in your safety zone. It’s no small step to say that when I started to think about going overseas, this song was playing in my mind. Didn’t I think it’s time for moving on? Time to leave the past behind? All this for quite a simple song, that took me ages to get my head around. So this is the number 1 album for 2006, so I like every song to some degree. But there’s other BIG ones, that are on the same level of Don’t You Think It’s Time. Clear second is Sadness & Whiskey. I always thought it should have been a single. It’s another escapist song. I don’t want to be that sentimental guy/Always dreaming of the years that passed him by. And there is something about the fact that it’s Kevin, it’s Bob, it’s this guy that I have known and followed for 9 years, that makes this song resonate. That guy in that band that inspired my first band so much, who dressed in bonds t-shirts, scruffy dyed hair, converse indie etc, was becoming a grown up. And I felt I was too. Sadness & Whiskey also had a pure, romantic core. And that love is all over the album, which was dedicated to his then-girlfriend, and now wife. There’s more songs I can waffle on about, but I will pick just one more. Me & My Friends is the last, hidden, track. Like the whole album, it’s brilliant in it’s simplicity. It’s vignettes of a night out – getting stuck into a few, leavinga trendy bar for a dirtier one, being left alone as everyone’s on their mobiles and saying cheers. It’s a perfect song about drinking with friends, and I don’t know anyone else who’s written such a song without making it sound like Oasis. This song has captured many a nights I’ve had, and if there’s a god, many a night to come. So it seems it comes in waves. Serious and sad albums followed by one pop record that turns back the tide, and keeps me going. Some people wait every five years for the new Nirvana. I wait every five years for a pop record to stop me getting too obsessed with Zappa or Cohen or other serious rock.